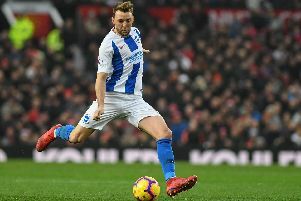 Brighton & Hove Albion midfielder Dale Stephens aims to hit the heights of an eight-out-of-ten rating every week. Stephens has been with the Seagulls for five years after joining from Charlton. The 29-year-old often gets the brunt of stick from Albion fans for his style of play but he admits that is nothing new to him as he has experienced it at some of his other clubs too. He began his professional career with Oldham, before playing for Rochdale, Southampton on loan and Charlton until his move to Brighton. Stephens played a key role in Albion's promotion to the Premier League in 2017 and he fully accepts he will not be the type of player who excites fans. Asked if the stick he receives is water off a duck's back, Stephens said: "Of course. It's something I've spoken about previously and I've had similar situations at other clubs too. "I think it's because of the sort of player I am. I'm not going to get fans on the edge of their seats. I fully understand the role I have in the team and I've had it at previous clubs as well so it's something I've got used to. "I'm not going to be a crowd pleaser. I know my job and know my role and I know the levels I've got to hit. "If I' m not hitting those levels then our squad is good enough for me to not play. I know my roles and responsibilities." Stephens does not look at individual stats too much when he plays but knows what level he has to hit in games: "I try not to read too much into stats, more my levels in terms of being an eight out of 10 every single week. "I think that is key in the way that I play and the role I play in the team. It's key for me to stay at a level where I'm consistently good hopefully."